Subject : TSRS 5th Class Admissions, Selection List 2015 - 2016. The Admissions are started for the 5th Class students in the Telangana Residential Schools, these were made on the selection basis in the merit list, and these list will be given in the district wise . @ http://tsrjdc.cgg.gov.in , and the notification can be downloaded @ http://tsrjdc.cgg.gov.in/Documents/Prospectus%20%20V%20ADMISSIONS-2015.pdf . 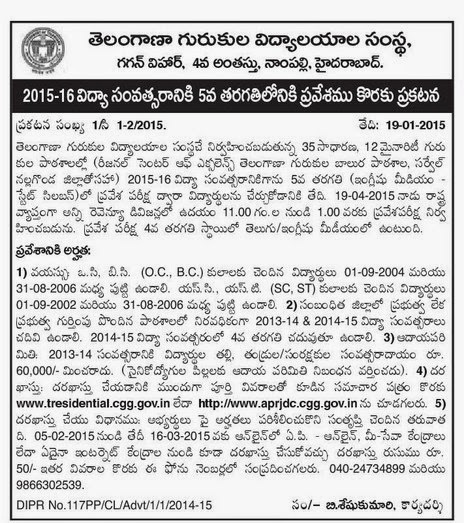 Starting Date For Online Application: 20/02/2015. Closing Date for Submission of Application forms: 16/03/2015 (11:55 PM).